All-In-For Alicia, A Big Success! When God shows up, and the "Ignite Youth Group' get involved BIG things happen. And that's exactly what happened on Friday night, March 9th, at the All-In-For Alicia spaghetti supper benefit that was held at the Stronghurst United Methodist Church. Ignite Youth group members and leaders were joined by a multiple of other volunteers from many local churches, teachers from West Central Elementary and some even driving over from Iowa. Over 20 kids pulled together to serve the meal, wait tables, buss tables, clean up and take out the trash, wash dishes, fill the dessert table and fill carry out orders. Roughly 20 adult volunteers participated also. 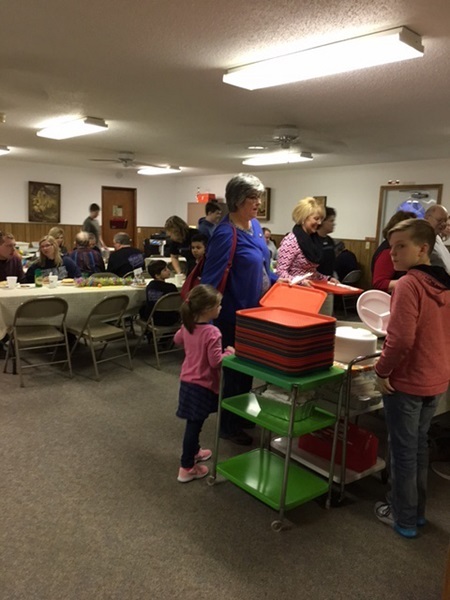 Spaghetti, green beans, garlic bread and desserts were planned for 400 people and a little over 400 people were served Friday night. It didn't all happen on Friday night as volunteers worked all day Thursday and Friday to prepare the meal. 30 lbs of hamburger was cooked, 7 plus gallon of sauce, 35 lbs of spaghetti noodles, 20 gallons of green beans, 42 loaves of French bread and two long tables filled with desserts. The supper was completely funded by local donations of supplies, money and desserts, therefore all proceeds from the supper go directly to Alicia Pence, who is battling cancer. Amanda Randall was selling All-In-For Alicia t-shirts and there was a raffle for a basket donated by Raritan State Bank. Quentin Peterson won the basket and then gave the basket to Alicia. The t-shirts have all been donated by a local business so every dollar paid for a shirt will be given to Alicia also. The benefit brought in over $9,000, not counting the t-shirt sales and the donations that are still coming in. Many people stopped by, without taking meals, to drop a donation in the bucket and give Alicia a hug and have a short visit with her. Alicia's family was by her side for the evening, showing a display of support. For a small community, the outpouring of generosity and love was simply amazing and for Alicia and the Ignite Group they feel God blessed the evening and touched all who passed through the doors throughout the night! "It is truly a blessing to live in such a generous community," Alicia said.